One trend that was really popular is spring made it’s way to being one of the best prints to wear this summer season. Gingham – usually a black and white checkered print, has been appearing on every type of clothing. The print is a classic style fabric that is pretty, preppy, and can be paired with almost any color. I have been wear the print since April, but over the past couple of months I picked a few more fashion items that are covered in the lovely gingham print. 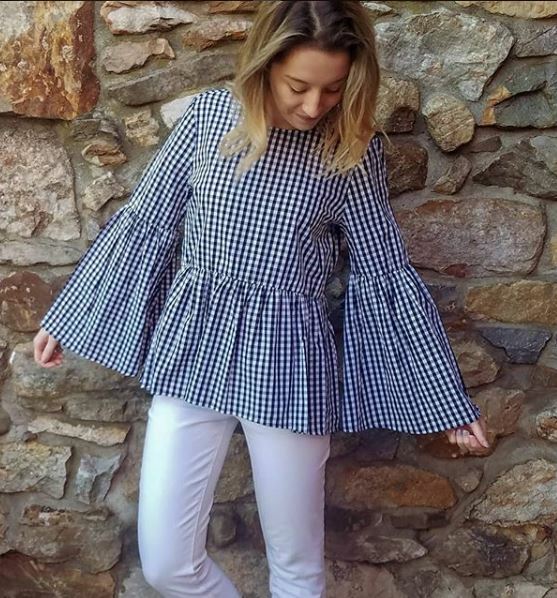 I first started seeing the gingham trend appearing this past spring in the form of bell sleeve tops, crop tops, and button downs. Now for summer I am seeing the print in off the shoulder tops, peplum t-shirts, and tank tops! It is most likely because the weather is warmer, we have tops that show off more skin. My personal favorite is the off the should blouse. A simple black and white gingham top that has an elastic band around the top so that you can stretch it out over your shoulders. The beauty of this print is that it generally comes in black/white, pink/white, or blue/white. This means that you can pair the top with any number of colored bottoms! Just try to stick to a plain solid color. White shorts or pants will look best. A fun way to incorporate gingham into your outfit is to wear it in the form of a dress or skirt. It took me awhile to come around to this because I am not the type to wear bold prints in a dress or skirt. I have seen other bloggers wearing all gingham dresses and they look fabulous. They will pair the dress with simple sandals and a summer straw bag. The cute thing is that the dresses have been in soft pastel colors like pink or baby blue. Wearing the gingham print in a skirt can be difficult because you have to pair it with a top that will not overpower the skirt. I did some outfit research on Pinterest and found that simple white t-shirt looks adorable tucked into a long gingham maxi skirt. A trend I have been trying to break into this season has been gingham pants! I really want a pair! I was looking at a pair from Old Navy that I loved but they sadly did not have my size! I can just imagine myself waiting a cute blush pink peplum tee, and white mules. I am quite surprised with myself for wanted to try this trend, because I am usually a very solid color person when I comes to my outfits. Gingham pants are bold and scream confidence. If you are planning on wearing the, I would wear a solid color top in a neutral color, paired with sandals or flats. The pants will be the focus point of your outfit, so you want to just wear very basic tops, jackets, and shoes. Since it is summer, the perfect place to incorporate a trend and have a lot of people see it is to wear it as a swimsuit to the beach! Gingham swim wear has become big this season especially in one-piece suits. I have seen the print in black, red, pink, and blue. This cute and timeless print will make your swimwear game stand out and you’ll appear more feminine. Find a statement suit like a one-shoulder monokini, a high waist bottom bikini, or just a simple triangle bikini set. Paired with your favorite beach bag and sunglasses, you are ready to hit the sand! An unexpected place I have seen the gingham print appear is in shoes! I personally own a pair of gingham bow slides from Old Navy and they are perfect to wear to the pool or when I am out shopping on the weekends. I have also seen the print on flats, sandals, and heels. This is great for when you want to try out a bold trend like gingham, but you don’t want to commit an entire outfit to the print. You can just have that pop of style on your feet. Great to wear with white trousers to the office or with jeans and t-shirt for weekend wear. Next time you are out shopping looking for something cute to wear to your next beach trip or family barbecue, steer away from the boring solid colors and have some fun by wearing gingham! The pretty checkered print will brighten up your outfit and your moo! Whether you wear the print in the form of an off the shoulder top, one piece bathing suit, chino pants, or flats – there is a place for gingham in your closet. Join me as I try to live a comfy, cozy, and stylish life through fashion and home decor.